There are free keyboard like SwiftKey , but also so expensive keyboards sold as TextExpander for $ 5.However, there is a note that only the new Apple keyboards have the voice input, the keyboard can not currently install this part. To use the new keyboard for your iOS 8, ​​the first choice in the The following keyboard, installed on your computer. After installing it in Settings -> General -> Keyboard -> Keyboards -> Add New Keyboard -> Select your new keyboard installed -> Then you need to click on the keyboard again and select: Allow Full Access. SwiftKey (Free) [ Link ] – Software surfing input by hand on the keyboard was very famous. The keyboard learns your typing and autocorrect dictionary and optimization, data stored on Cloud SwiftKey though you should still change the machine to be used. Swype ($ 0.99) [ Link ] – Just like SwiftKey, Swype is a keyboard-based gesture input, you glide your hands over keys to “write”. Keyboard dictionaries available for use. But with prices $ 1 is not as attractive as SwiftKey. Minuum ($ 1.99) [ Link ] – With this keyboard, you can change the size of the key by pulling it high up or collapsing. The keyboard can also input by sliding your finger. Fleksy ($ 1.99) [ Link ] – they call this a data entry keyboard with the world’s fastest guessed from the same system to support a very good operation. Regarded try the video below to learn more okay. In addition, the keyboard also allows you to change the key size. 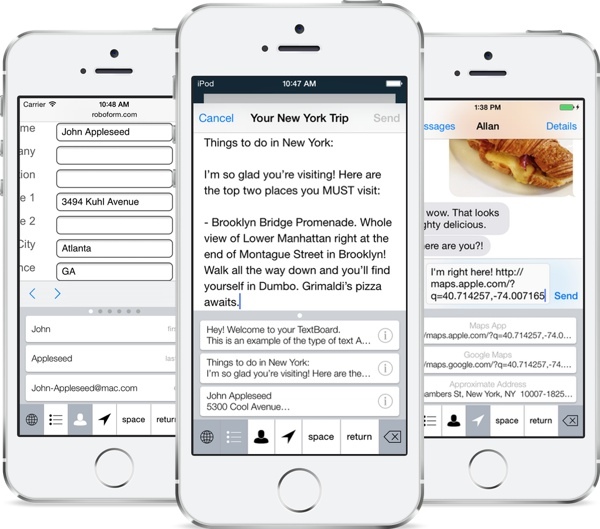 TextExpander ($ 4.99) [ Link ] – With TextExpander, you will build yourself a database shortcuts. Since then the input will be faster because you only need to type the shortcut and not have to type the whole phrase again. KuaiBoard ($ 1.99) [ Link ] – With KuaiBoard, you will create the templates as your name, address, message content available. Then instead of typing data entry, we’ll select the patterns that are available.